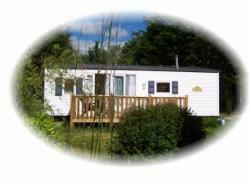 We have very new and modern mobile homes for hire on the beautiful scenic 4* camp site of L'Orangerie De Lanniron. Plenty of on-site activities for all ages, plus a bowling alley, adventure playground, indoor pool and boating lake within a few minutes walk of L'Orangerie De Lanniron. Our homes are set in the botanical gardens of a 15th Century French Chateau, which stands on the banks of the River Odet. You will find each of our homes very well equipped with all you could possibly need, including free fans and heaters. There is an english speaking reception who can offer advice on where to go and what to see during your stay, offer a money exchange service, internet usage, weather forecast, itinerary of what's on day to day on the camp site and are very helpful with any queries you may have. The camp site is just on the outskirts of medeival Quimper, it is about a 15 minute stroll into this wonderful city. 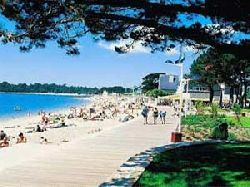 The nearest beach resort is Benodet, about a 15 minute car journey. Our homes are aimed at couples and families only. Groups of youths are not allowed on the camp site. Sorry, We do not allow pets and there is to be no smoking inside the homes. 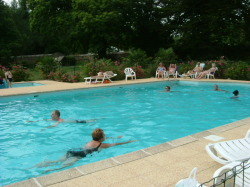 The facilities on the campsite are available between 15th May 2008 and 15th September 2008. 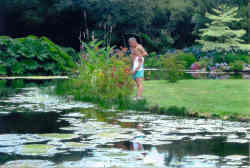 Many guests reside in our homes outside of thes dates to enjoy the beautiful gardens and the surrounding area of Brittany. All guests arrive to a freshly cleaned home. You will be invited, (optional), to a guided tour of this beautiful camp site and learn the history of the chateau and gardens. Then on to the bar for a welcome drink and nibbles and receive information of what's on and where to visit during your stay. Thank you for taking the time to read our advert, please don't hesitate to contact us if we can be of any help. We offer free no obligation quotes, literature and information. Route maps are sent to all our customers for convenience in locating the camp site. All enquiries are answered promptly. Visit our availability calendar, all blue dates are currently still available. All out of season weeks are priced at �160.00.